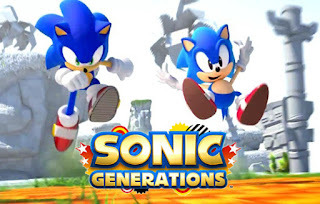 It was not long after April 18 2011 - when the first Sonic Generations trailer was released - that something inside clicked. I had been with Sonic for ten years now, but only as a general fan. I hardly took notice of any games, hadn't played most of the games released since Sonic Heroes, and definitely wasn't a part of any fan related groups online. So what was it that made me take notice of Sonic Generations, which ultimately crafted me into the fan of the series I am today? The original trailer was pretty much a showcase for the fact two versions of Sonic would be in the game. It did little more than show the series was still going strong - 20 years is a pretty long time, after all. When the first look at gameplay was shown off, the boost style of play was new for me. I was certainly interested in this new style of play, and seeing how 2D and 3D viewpoints had merged for the modern stages was also new for me. I can't remember how I felt about it back then, but if it's similar to how I feel now, then my opinions probably haven't changed from seeing the gameplay to gaining experience for myself. Seeing all the other things throughout the trailers was also mostly new to me. You've got to remember, at this point my experience with the series was solely Adventure 2: Battle, Heroes, 3D Blast, R, and the first two Advance games. I certainly knew some parts of the classic games, but seeing the likes of Speed Highway and Crisis City - even Perfect Chaos - was completely new for me. It was as though all this history of Sonic the Hedgehog that I'd missed, as well as some of the best parts of familiar ground, was all coming together into one game. When I got my hands on the demo, I couldn't stop playing it. I absolutely loved the gameplay style for modern, and found classic to be fun as well. As for the full game, I found the level selection to be good. I've seen around that the amount of city levels was too much, but I didn't really mind that. Despite being city levels, each was pretty different from the others. City Escape and Rooftop Run had many differences in both style and gameplay. Crisis City had the destruction play to its advantage, and Speed Highway being set at night, as well as having moving cars on parts of the level, made it feel that much like a real highway. Green Hill, the staple of the series, has never looked so good. It plays great as well. Chemical Plant had the crazy pipes as paths, and the pinkish water to get drowned in. Sky Sanctuary I had never seen before, so was new to me, and I loved it. The ancient yet mystical aesthetic of it, as well as being in the sky, really made me appreciate it. It also helps that it was also good to play on. Seaside Hill is a favourite of mine from Heroes. Of course I was pleased to see it back, as I was with City Escape. Boosting throughout the design of it, and how Ocean Palace had been merged into it, was an interesting experience, but I loved it. The same cannot be said of Planet Wisp however. For some reason, I never liked it when I played first time. Green Hill was a blast, as was the other classic stages. Speed Highway was a fun experience, as was playing through remixed versions of stages from the only main series games I had played. Crisis City never bothered me as I found the design different from everything else in my experience of Sonic games. Rooftop Run I fell instantly in love with. But Planet Wisp has never been a favourite, nor have I ever really liked it. The first part of the modern stage I was fine with. As with the classic stage. In fact, Planet Wisp in Generations is the only stage I much prefer playing in Act 1 rather than Act 2. And the funny thing is, despite not liking it, I've never been able to find much of a reason to not like it. It's just... something I don't. I can't even say it's because of the game it represents, having never played Colours at that time. And I certainly can't say it's because of the Wisps, despite my aggressive feelings for them [oh, I can still remember my reaction on SSMB when it was so much as hinted at their return for Lost World], simply because that was my first time using them, and I certainly enjoyed whizzing around with Pink Spike. It's something I've never understood and probably never will. Just like the stages, most bosses were new to me as well. Beating the Death Egg Robot was enjoyable, what with attacking it's underside, then part two by having it stun itself by attacking bombs. 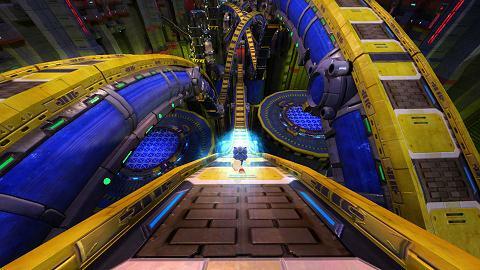 Metal Sonic, oh how I loved playing as you in Adventure 2: Battle's multiplayer. Now I'm fighting you as a boss. Well, rival. It was a fun chase, though as with a few of the bosses, it did feel a bit broken or unresponsive. Whoa, Perfect Chaos, don't destroy the city with your water! I'm a hedgehog who hates water, and now I'm fighting you in one of the better bosses in the game. Yes, the layout of the boss fight felt great for me. It felt more like an actual level with the boss being integrated into it. And oh how fun it was. It's a shame that Shadow's fight wasn't as interesting or fun. To paraphrase Escape From the City - boosting around in a giant ring, both of us running just to absorb the power, finally got one, now for the other, now time to quickstep rocks for the final take out. While the circuit did have some elevated paths, a few rails, and trick ramps and rings, it always felt safer just sticking to the main path and hoping you never ran out of boost. The Egg Dragoon was a bit more interesting with the varied methods to land hits, but fell into roughly the same pattern. 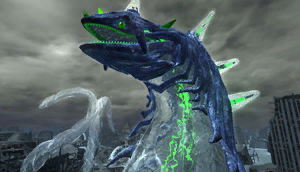 At least this boss actually attacks though, unlike Shadow. As for Silver's boss fight... I liked it. Honestly. What I didn't like was the fact, for me at least, it felt broken half the time. The homing attack blip sometimes wouldn't highlight despite being within very close proximity to the target, and a flaw on my end was I never really understood all the attack patterns for the fight - especially the ending hit. But that still didn't stop me liking it. The final boss... now that's something I hate. Eventually I finally understood this boss fight, but it never made me like it. Despite the fact I've never reached that many final boss battles in Sonic games, I can seriously still say the Time Eater is my most hated. For one, it feels completely broken. I've ended up on the side, unable to move back to the centre without switching to 2D. There is also hardly any way to see obstacles or rings coming up because the background is just a mess of black and purple. The challenges were interesting mix ups, with some very enjoyable ones and some frustrating ones within a lot of simple yet effective ones. Each challenge unlocks something, whether art or a piece of music, with some also giving out perks which can be added on. While I hardly ever use the perks, or look at the art, the music is a welcome addition. Five Red Star Rings in each act will also grant art and music per one collected, and again the music is what I felt was great. The concept art is interesting, but the game allows the music to be swapped for all levels, and having What I'm Made Of playing while blasting through Speed Highway Act 2 is awesome. The music is from every game as well, and even though some games get more representation than others, the offering is still great. I still play through the stages of modern Sonic quite a lot, and even drop into some classic stages or bosses every so often, and it still strikes me how replayable these stages are. In a half hour play I usually repeat stages [particularly from the Dreamcast era] and still find them fun. That's just how the game is designed. Now, could there be more content? Oh my, yes. 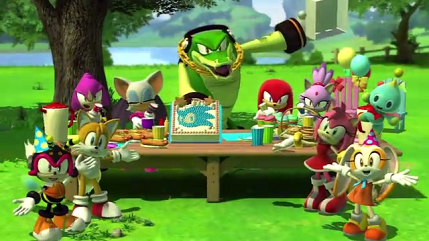 Character interactions are woefully inadequate unless that character is a Sonic, Tails, or Eggman. I would have taken more full stages rather than the challenges, possibly including two levels per game and a boss from that game. The other characters could have done stuff, or made comments of the world they were in from within that world, such as when Sonic and Tails were in Chemical Plant having a conversation within a cutscene. There is so much that could have been done to make the anniversary game that much more spectacular. What we did get is a good celebration of stages that are from the most memorable parts of the games, with recognition of the main cast, as well as plenty of additional content recognising the wider world of Sonic the Hedgehog. The 25th anniversary of the franchise is soon to be at an end, but the two games coming soon feel like a celebration doing things right. Mania remixing classic stages while including new stages that gives nods to previous material while still being their own thing. While we don't exactly know what Project Sonic 2017 is bringing to the table, I'm hoping it does things right in building a strong and replayable game.